Shots from some of the concerts and events at the Spokane Arena in 2013, which proved to be one of the most successful years in the venue's history. When a capacity crowd began funneling through the doors of the Spokane Veterans Memorial Arena last November to see Pearl Jam play in the city for the first time in 20 years, Matt Gibson saw something unique. "It wasn't that people were just excited about the show, they were happy," says Gibson, the Arena's general manager. The Pearl Jam show on Nov. 30 — which the venue considers one of its most significant concert bookings since its opening — capped a 2013 in which the Arena saw a total of almost 100,000 fans come through its doors for concerts alone. It wasn't just a good year for live music; during 2013 the Arena, which was built with public funds in the early 1990s, was in use for 160 days, including Spokane Chiefs hockey games, Spokane Shock football games, bull riding, high-school basketball, graduation ceremonies and a bevy of other diverse events. Gibson says it was the venue's best year in terms of attendance since 2010, when the Arena hosted both the U.S. Figure Skating Championships and NCAA men's basketball tournament games. "As far as concerts and entertainment, we hadn't seen that sort of excitement since the first few years after the building opened in 1995," says Gibson. 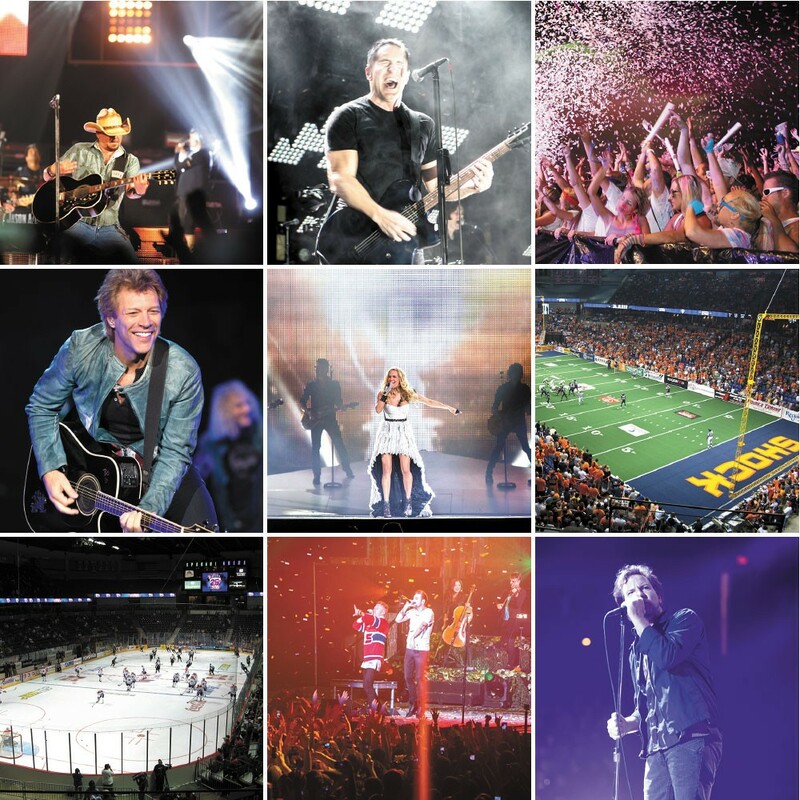 It was the last three months of the year, which featured shows by Bon Jovi, Macklemore and Ryan Lewis, Nine Inch Nails, Trans-Siberian Orchestra, Zac Brown Band and Pearl Jam, that got Gibson and company thinking about the possibilities of their venue. "We've had good quarters, but that last quarter was really exciting. We're looking to create more of that and be strategic about it," he says. The strategy the Arena is rolling out isn't what some might expect from the book-it-if-it-will-come-here live music business. Becca Watters, the Arena's marketing manager, calls the plan The Bucket List, which begins with a wide-open call on the Arena's website for locals to recommend a band they want to see play the venue. It doesn't matter how outrageous you think your recommendation might be, they want to hear it. After all, she says, the Pearl Jam show resulted in part from an Inlander article wishing that the band would come here. There's no way to guarantee that the band that gets the most recommendations will come to town (bands' touring schedules are notoriously fickle) but at least it gives the Arena some community support to take with them when they go out looking to book shows. "We want to know what Spokane wants to see," says Watters. "Having the backup [of public demand] gives us leverage to say, 'Look, Spokane wants to see this band." The Arena already has strong prospects for 2014. The Chiefs are winning games and filling seats, prog-rockers Tool announced their only Washington date of their tour would be at the Arena in March, the NCAA tournament returns and soon the Shock will be in season, again likely attracting the top attendance in all of Arena Football. They hope to keep the lineup of events as diverse as possible going forward — providing a little something for everyone. "We're looking for different segments of the population to come here, so they get in their heads that this is an exciting venue," says Gibson. Bringing more people into the Arena is about more than just providing more entertainment for the city — there's an obvious economic impact. An event at the facility puts as many as 300 people to work, either for the Arena itself or for one of its vendors. A typical hockey game employs about 150 people. And given Spokane's location, the Arena serves as a regional venue when it comes to big concerts, a fact not lost on the city's tourism officials. "In the market research that we have done, we consider the Arena a key player in our ability to attract people to Spokane through entertainment," says Visit Spokane president and CEO Cheryl Kilday. The Arena tracks its out-of-town ticket sales, which they consider anyone coming to an event from 150 or more miles away. For many concerts and events, as many as 30 percent of guests fall into that category, many of whom will stay in the city's hotels and patronize its restaurants. Kilday says that the 150-mile radius is actually a conservative boundary, and that guests coming from closer locations also are likely to book a hotel room, amplifying an event's tourism impact. With last year's momentum, Gibson and Watters say they know how important it is to people to have something come to the Arena over the course of the year that they'd like to see. In the end, they feel that it's the people's venue. To submit your recommendation for a band you'd like to see play the Spokane Arena, visit spokanearena.com/bucketlist.